Over 80% of the population will suffer from lower back pain during their lives. A back muscle strain or ligament strain is one of the most common causes of acute lower back pain. Lifting a heavy object, twisting, or a sudden movement can cause muscles or ligaments stretch or develop microscopic tears. This is often a result of a long accumulation of muscle tension. However, the following can also be the cause. Ceasing activity for a few days allows injured tissue and even nerve roots to begin to heal, which in turn will help relieve lower back pain. However, after the initial few days of rest, progressive and gentle exercise will usually help to reduce the pain. Exercise will help to keep the back muscles and spinal structures conditioned, otherwise long periods of inactivity can lead to deconditioning and weakening, leading to further back injury and strain, which causes additional pain. In addition, movement helps exchange nutrients and fluids within the discs to keep them healthy and prevent pressure. Every individual is a different shape and size, even two people of the same height and weight will require different settings in a chair. 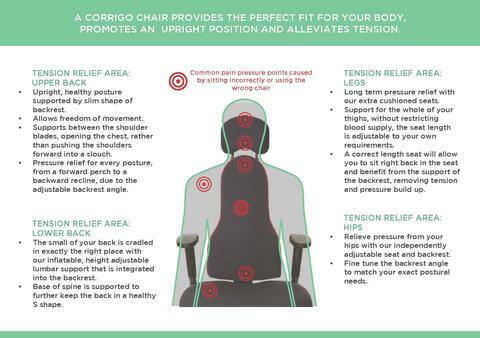 Corrigo chairs recognise and embrace this individuality and our chairs therefore provide far higher levels of adjustability found in most chairs in the market place.